ADVANCED AIR has (17) weekly routes from Albuquerque to the Grant County Airport. Flights from Phoenix (PHX) to Grant County Airport are 7 times per week. Please visit their website for bookings and choose Silver City (SVC) as your destination. The airport in El Paso, TX requires a 2.5 hr. driving time. Albuquerque airport is another option, but requires 5 hrs. of driving time. WARNING! 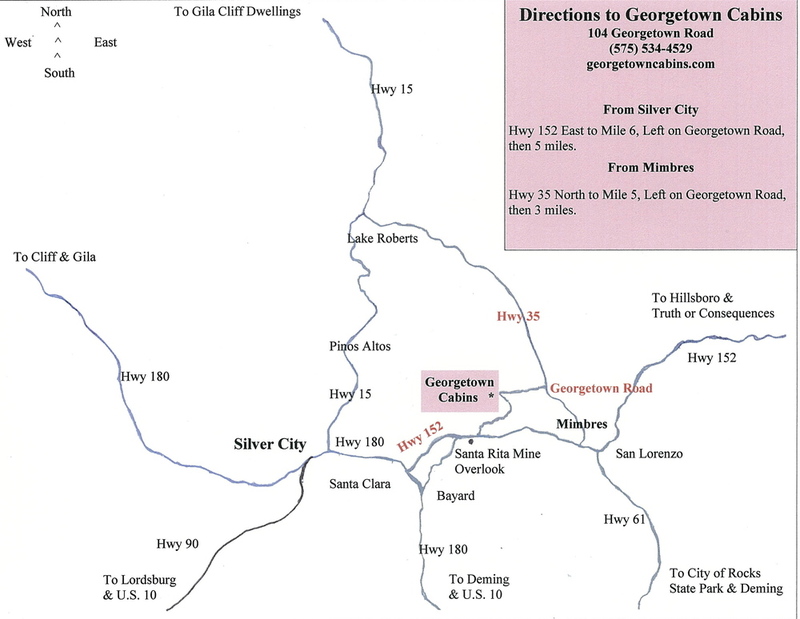 Google Maps in incorrect in giving the distance from Silver City to Georgetown. It is 25 min not 47 min! PLEASE NOTE Google Maps, Yahoo Maps, some GPS, etc. may not be always correct in locating Georgetown Cabins. Turn right onto Highway 90 and continue 45 miles to U.S Highway180 east on your right. Continue on U.S. Highway 180 east 8 miles to Highway 152,on your left. On Highway 152 continue 6.5 miles to Georgetown Road, which will be on your left. Georgetown Road is .5 miles past the Santa Rita Mine Observation Point, at the bottom of the hill. Turn left onto Georgetown Road. After 1 mile, the road will fork, take the right. Continue for 4 more miles, Georgetown Resort will be on the LEFT. Take Interstate 25 south to NM highway 152 Exit. Follow NM highway 152 to NM highway 35. Turn right onto NM 35 and continue 5 miles until Georgetown Road. Turn left on Georgetown Road and continue for 3 miles. Georgetown Cabins Resort will be on your RIGHT. Turn right on Highway 61 and travel the Mimbres River Valley 25 miles to Highway 152. Turn left onto Highway 152 and continue .9 miles to Highway 35. Turn right onto Highway 35 and continue 5 miles, pass the Mimbres Post Office and vacant little red store. Georgetown Road will be the next street on your left. Turn left onto Georgetown Road. Continue three miles. Georgetown Cabins Resort will be on your right.